Decorating for the holidays is fun no matter what your age. In our house we have a great mixture of unique vintage finds mixed with inexpensive Christmas decor and a little fun for the kids as well as some equestrian touches. 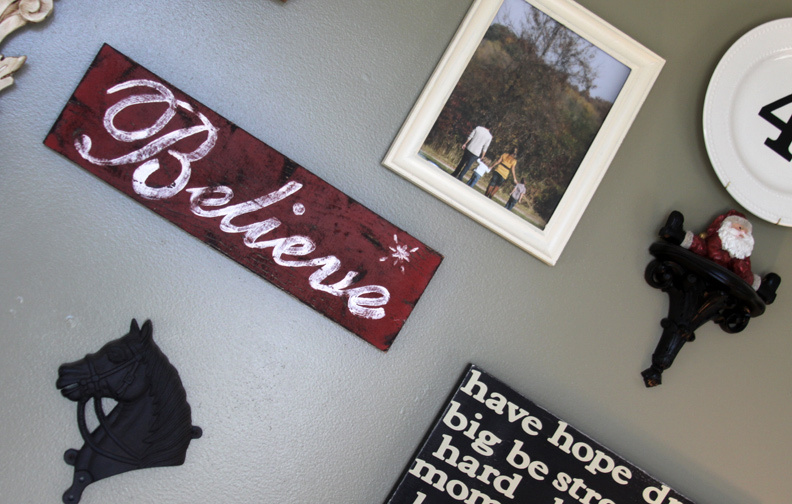 When we decorate for the holidays it’s all about what makes us each happy. It doesn’t have to cost a lot to be beautiful and full of meaning. I like to leave a little of our normal decor out and just mix in a few simple holiday decorations here and there. 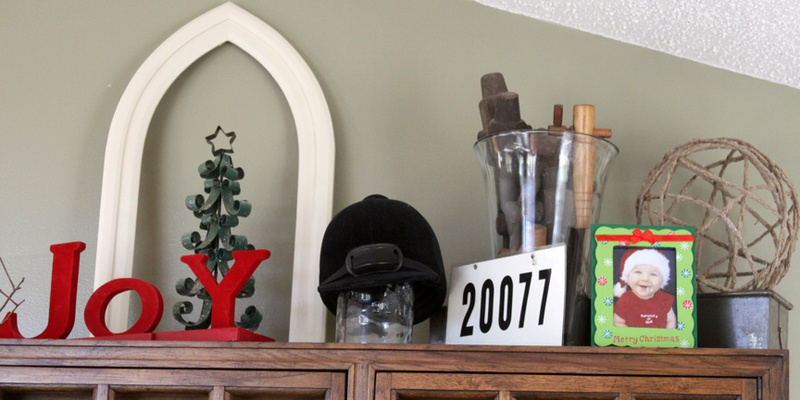 On top of a large bookcase I have some of my favorite equestrian pieces of decor. 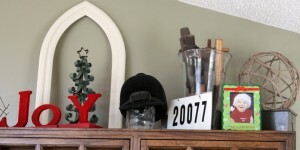 I have an old vintage riding helmet and one of my old show numbers mixed with an open frame. I added some holiday touches with pretty red velvet letters J O Y, a metal Christmas tree and a favorite Christmas photo in a holiday frame. In the background I have a glass vase filled with old wooden spouts and old tin trough topped with a DIY ball made from twine. 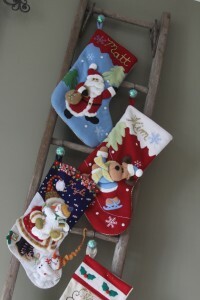 By changing things we already have around the house we can really inexpensively decorate the whole house for Christmas. 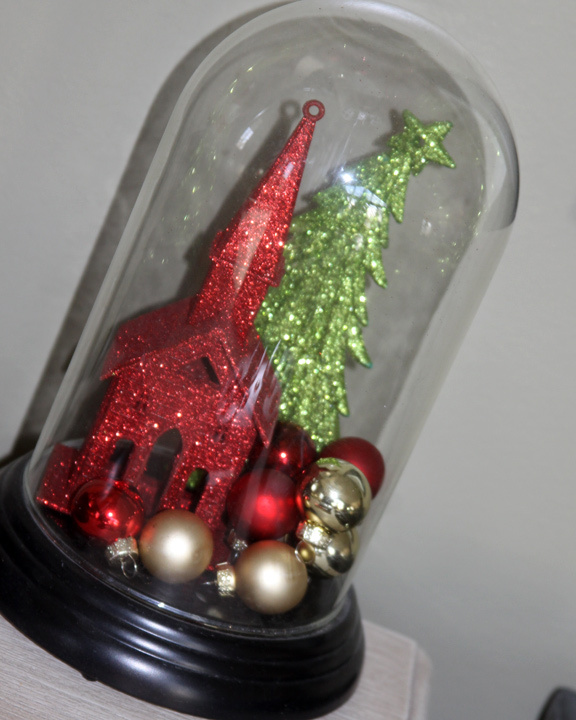 I replaced the items in my do it yourself cloches around the house with mini Christmas ornaments. I found some adorable sparkly ornaments at Walmart last year that I added to the cloches as well. The church and the tree are a great reminder of what we are really celebrating. 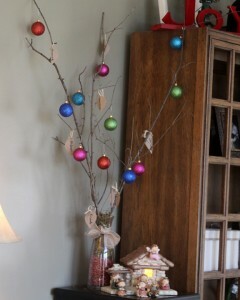 I also reused my thankful tree we made for thanksgiving by adding some sparkly little ornaments to it. The natural tree looks great over our nativity scene. We eachd picked a couple of our favorite blessings written on the leaves to keep on the tree as a reminder of how lucky we are. 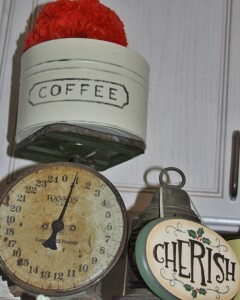 I love old vintage or antique scales. I have one that I keep out all year round and one that only comes our during the holidays. 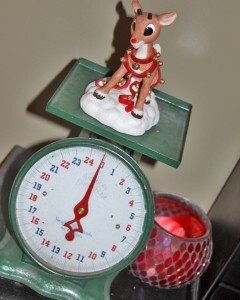 Since we love Rudolph so much he gets a place of honor throughout the holiday season on top of a vintage red and green scale. 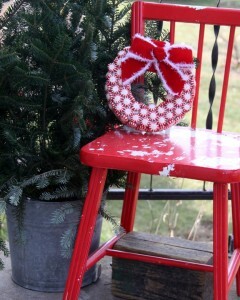 The other is topped with an old coffee can and a DIY crepe paper ball in a bright holiday red. I surrounded that with an old lantern and hung a cute little Christmas sign from it. Of course, I changed up the two chalkboards in the house to fit the decor. This year I went with Christmas songs theme. I added “Have a Holly Jolly Christmas” to one and wrote “O Holy Night, the stars are brightly shining, this is the night of our dear saviors birth” in cursive writing on the other. I love that all I need to do is change the saying and it fits every season perfectly! 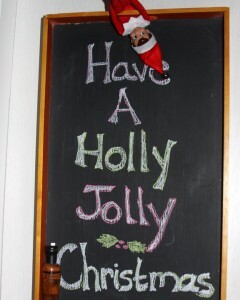 Our little Elf on the Shelf can always be found in a silly place throughout the house during the holidays as well. 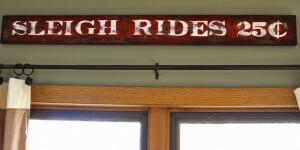 This year I added a couple of homemade signs that I created using leftover spray paint and scrap pieces of wood. 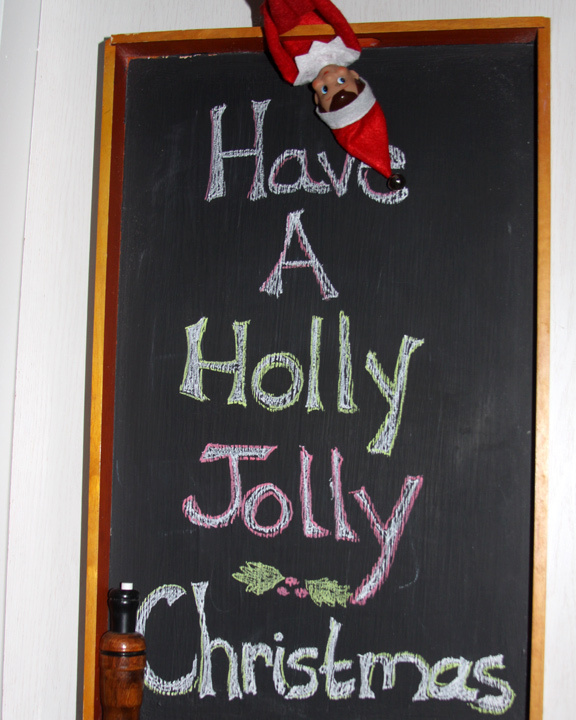 These signs are one of my favorite additions to our Christmas decor so far. 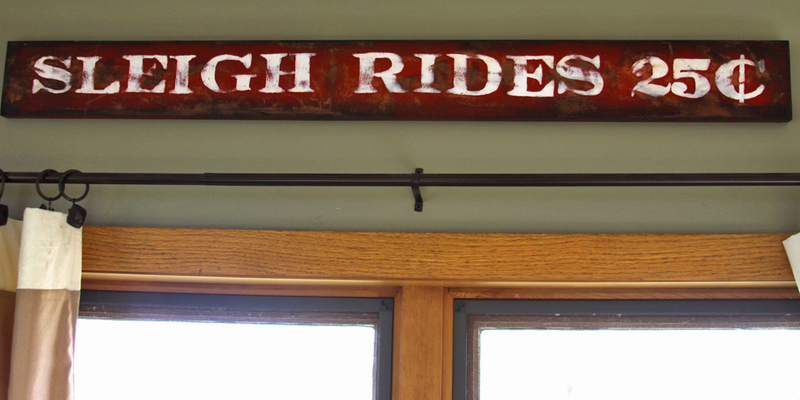 The vintage looking sleigh ride sign was almost free to make and it fits our home so well during the holidays. 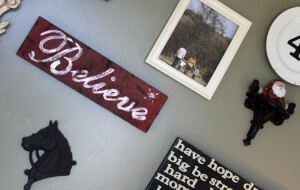 The “Believe” sign is added to our gallery wall along with a couple little Santa pieces for the shelves. 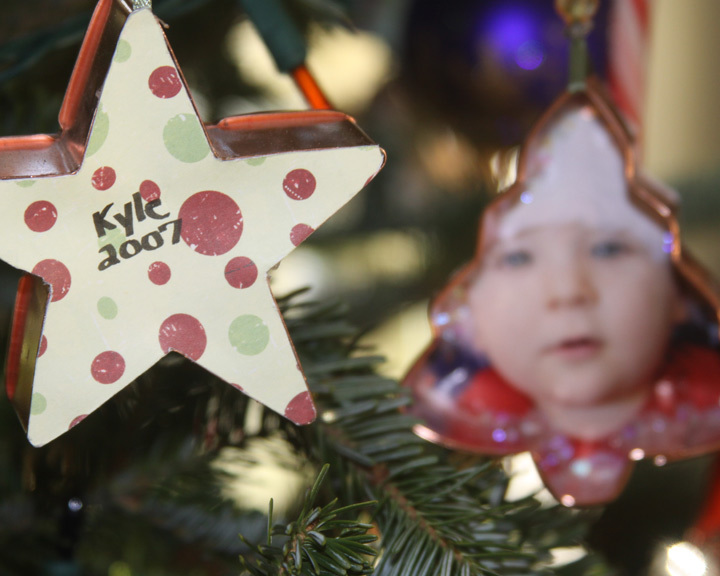 Our Christmas tree is adorned with ornaments that we have been collecting over the years as a family. We have a pretty good collection so far, and are always adding homemade ornaments to commemorate each year. Our entry to the house is decorated simply with a old worn hand-me-down wooden chair painted in bright red and distressed. Sitting next to it is an old antique bucket filled with the pine branches we trimmed from the bottom of our Christmas tree. Underneath the chair sits an old wooden block with a handle that was used in the horse barn at my childhood home to prop open the barn door. These pieces may not mean much to any one else, but they greet me with fond memories every time I walk in our door. I also made this adorable little peppermint wreath to hang on the front door to festively welcome our guests during the holidays. Someday I envision a roaring fire and a beautiful wooden mantel to decorate and hang our stockings from. That seems to be in the 20 year plan , so I improvised and created a stocking hanger from an old wooden ladder using shower curtain hooks that are covered in glitter. I love the way our home feels during this time of the year. So warm, and cozy and all lit up with colorful lights. Things to excite the kids, and things that provoke memories for us of Christmas’ past. I love everything about the excitement of the season and how it brings families together to celebrate. Quite honestly, I would miss all the hype if it was gone, but deep down it could all vanish and I would be perfectly happy being surrounded by the people that I love and relishing what this very special holiday is really all about. I am so very blessed to have unbelievable friends and family and a God that provides what we need throughout the year to live our best lives. Merry Christmas! I just really enjoy your unique decorating style! I’ve picked up some great ideas from you. 🙂 And it’s neat to hear the stories behind the things in your home! I’m so happy to hear you are finding ideas that you can use in your own home!!! I am really finding that less is more – and that things with meaning make our home so much more comfortable!